James Bond would be proud. The 226-foot (69-meter) Spectre, now with her hull and superstructure joined, entered Benetti’s outfitting shed this month. 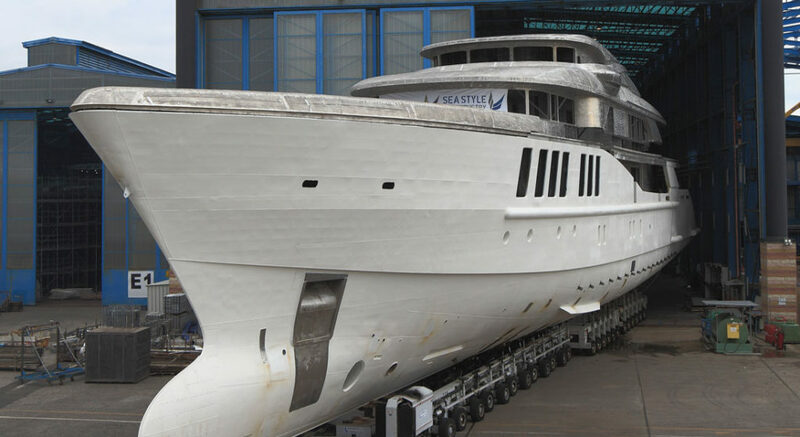 She made the transit from her initial construction facility to Benetti’s shipyard in Livorno, Italy. If you’ve followed the yachting industry for a while, no doubt you know that Spectre belongs to John Staluppi, an American whose love of James Bond movies might only be eclipsed by his love of the yachting lifestyle. This is his third Benetti, and his biggest megayacht thus far. Spectre rises five decks high, too. While Spectre will boast two master suites (one with a private alfresco area), two main-deck VIPs, and general relaxation spaces for 12 people, her technology makes her special. Staluppi has long been a performance enthusiast. These days, he still wants some speed to make traveling between destinations shorter, but not at the sake of fuel efficiency. Therefore, Mulder Design created what it calls a Hi Speed Cruising Hull. Spectre should see a top speed of 21 knots, 30 percent quicker than the norm for her size. Simultaneously, she should see a 6,500-mile range at 12 knots. Mulder Design further says the yacht should consume about a third less fuel on long crossings than comparably equipped displacement yachts. The engine package is a pair of 12V MTU 4000 diesels. Spectre will mark a significant first for Benetti, featuring Naiad’s Ride Control stabilization system. In brief, it lessens the impact of both roll and pitch. (Most stabilizers on the market address just roll, since it’s the most common comfort problem.) In addition, in some situations, Ride Control can damp yaw, yet another unwelcome motion. Spectre will remain under wraps in Livorno for about another year. Launch should take place by summertime in 2018. That’s when we’ll get the first looks at what’s sure to be a flamboyant interior. It’s by Giorgio Cassetta Design and Benetti’s in-house team.